Republica Hostel Bogota i Bogota, Colombia: Bestill nå! Relax in our common areas surrounded with plants and fresh air. Our rooms are equipped with charging outlets, reading lamps and private lockers. Fresh towels for rent, breakfast is included. 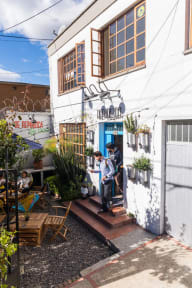 We offer a unique location different from most hostels in the Bogota. The old British architecture, alternative Bars, and local design shops and are all around and give the neighborhood a chill rustic yet modern feel. The Gastronomic center ‘Zona G', Award Winning coffee shops, and Bogota’s best night life in ‘Zona Rosa’ all just 5 minutes away. We have 24hr Reception desk, Computer, Free Wifi, TV, Laundry Service, Bar and Tours, to your disposal. We speak English so be sure to ask anything to our staff. Payment upon arrival, we accept cash, credit or debit cards. This property may pre-authorize your card before arrival. NOTE: All Colombian citizens have to pay 19% of taxes over the prices show in hostelworld. The door to the room automatically locked when we closed it and we had to ask the staff to open the door, because we didn't get a key. Except from that it's a nice hostel. Friendly staff. Nice part of town.